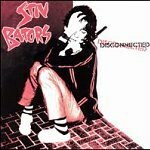 Issued after the break-up of the Dead Boys and before his albums with the Wanderers and Lords of the New Church, Stiv Bators's one and only solo record, Disconnected, is getting the 25th Anniversary remastering treatment from the folks at over at Bomp!. In addition to the album's nine original cuts, this new version contains several alternate takes, a live track, and a crank phone call. The 14-page liner notes, written by bass player Frank Secich, describe the wayward sessions (which were recorded on a basketball court) as including several notorious explosions and Bators' doing his vocals while getting head. But who didn't back in '79? It was as common as Bible thumping is today. The good time had by all translates well onto record: Bators's trademark whine is intact and the band, for the most part, exhibits solid rock chops. In short, it sounds like a less loud and snotty Dead Boys trying power pop and new wave on for size. The cartoon catchiness of the opening track, "Evil Boy", gets by purely on its sophomoric charm. Don't listen too hard to the lyrics, and the guitar playing is textbook "punk is dead" 1979. The drumming comes close to pushing the boundaries of taste, but I challenge you to listen all the way through without singing the refrain. Go ahead; try it. The monster movie swing and mumbled lyrics of "Bad Luck Charm" are similarly insidious, but the album doesn't make any real progress towards lost gem status until the full-blossom power pop of "A Million Miles Away". Arpeggios are the reason the electric guitar was invented, folks. It's just that simple. Add a little bit of pained searching to the lyrics (to which Bators's voice lends itself nicely) and you've got yourself a pot of gold. Well, maybe a pot of silver, or, at the very least, some nice crystal stemware. Regardless, "A Million Miles Away" is a notable performance not only for fans of the genre, but for anyone interested in seeing how the stripped-down, elemental noise of punk began to dress itself up in '60s pop at the dawn of the '80s. For further evidence of this transition, see "Make Up Your Mind". Again, I can't say enough about the importance of arpeggios. For the most part, the album's middle section fails to capitalize on the strength of "A Million Miles Away", instead relying on a handful of novelty tracks. The spoken word verses and chanted choruses of "Swingin' a Go-Go" are pure new wave giddiness. The gothic stomp of "Too Much to Dream (Last Night)" relies a bit too heavily on its own sense of smoky cool. The refrain in particular becomes a bit tedious after you realize it's not all that clever. "Ready Any Time" is the infamous blow-job song. Its blatant pro-carousing message plays itself out in lines like: "Got a ball point pecker loaded with an edible ink". Yes, it's that ridiculous. Its one of those tracks you should hear once. Maybe even twice just to make sure, but its interest is solely that of an oddity. "The Last Year" dispenses with the curiosities and gets back to business with a pleasant shot of double-vocal '60s pop. The original set ends on an even better note with the grandiose fist-pumping of "I Wanna Forget You (Just the Way You Are)". See the liner notes for how the band almost burnt down the studio recording that one. The alternate takes of "Evil Boy" and "Swingin' a Go-Go" are a little more raw and muddy than the originals. The live cut "Little Girl" contains numerous expletives and is dedicated to the girls in the crowd who got in with fake IDs. I shouldn't have to say anymore about that one. The instrumental track "Crime in the Streets" is a hidden nugget of Heartbreakers-esque guitar work. And the crank phone call? Well, they gots gumbo. And it ain't cheap.